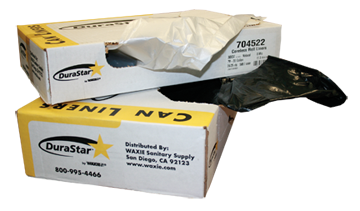 WAXIE’s DuraStar can liners set the standard for the industry. These durable can liners are manufactured with both linear low-density and high-density resins and are available in a variety of sizes and colors. All DuraStar can liners have “star bottom” seals that provide exceptional strength and performance. DuraStar’s topside dual-dispensing cartons allow you to pull from the top or may be stacked to save space while still dispensing liners from the side. The Star Seal is the best type of seal on the market. Designed without gussets, the Star Seal eliminates gaps along the seal where leaks can occur. This allows the bag to more easily conform to the shape of the container and distributes refuse weight evenly inside the bag. Star Seal liners maximize the bags carrying capacity and virtually eliminates leaks. Portion Control: A maintenance worker knows exactly how many are on a roll vs. just grabbing a handful of flat pack bags. This also is an inventory management benefit. Ease in Dispensing: Easier to carry 25-50 bags because of the packaging. Topside dual-dispensing packaging packed for end user convenience, our topside dual-dispensing cartons were developed in response to customers’ needs. Now, cartons may be stacked to save space while still dispensing liners with greater ease.